One student is delighted to be leaving college with two HNCs after being accepted on a dual qualification scheme and cramming in revision around his work. Ryan Little collected HNC certificates in electrical engineering and one in measurement control from the stage at the weekend. The 18-year-old from Ellon had originally started on a different course but applied for the Shell Engineering Scheme which doubled his workload. 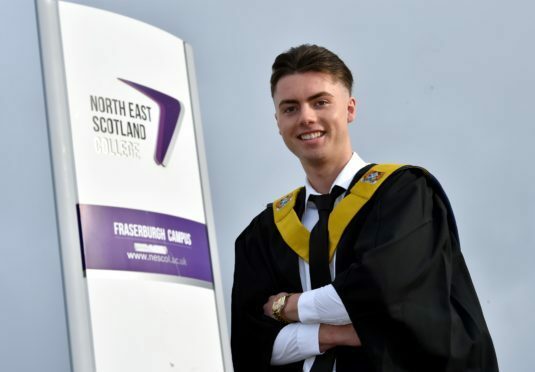 He believes it made his time at North East Scotland College’s Fraserburgh Campus more worthwhile and helped him land a job. He said: “The scheme is probably one of the best to get on to as you get to do two courses over the year. “It was hard work but I loved it as I was learning about things I’m interested in. “I’ve got a job now working for Subsea 7 as a technician. Mr Little balanced his studies with a supermarket role, leaving limited time to revise for exams and tests. He added: “It was pretty hard as we did the two courses at the same time with a lot of it crammed in especially towards the end. Mr Little’s friends and family gathered at his grandmother’s house to celebrate the occasion with tea and coffee.